Inzhtransstroy-SPb started installation of finishing coating of the roof of the arena on Krestovsky Island which will host 2018 Football World Championship games. It became possible to embark on these operations upon completion of cable-stayed system setup the other day. Roof assembly at one of the largest roofs in Russia in terms of total area is to be completed in the first quarter of 2016. Apart from main metal structures, the stadium’s roof consists of several layers: profiled sheet, vapour seal membrane, heat insulation, aluminum sheets and lacquer coating. Such material combination enables to protect stadium’s inner rooms from precipitations, preserve heat, prevent from condensate accumulation under the dome and gives an attractive appearance to the stadium. Roof operations were preceded by long preparation: geodetic surveys were performed, surfaces were levelled, operation optimization issues were elaborated – with due account of all resources, time and sequence of process operations. For this purpose, operations were performed on reference sections for several weeks. Besides, during the work over roof development design all import materials were replaced with the ones made in Russia. The whole range of works related to roof finishing will be implemented featuring St. Petersburg company Atlant. 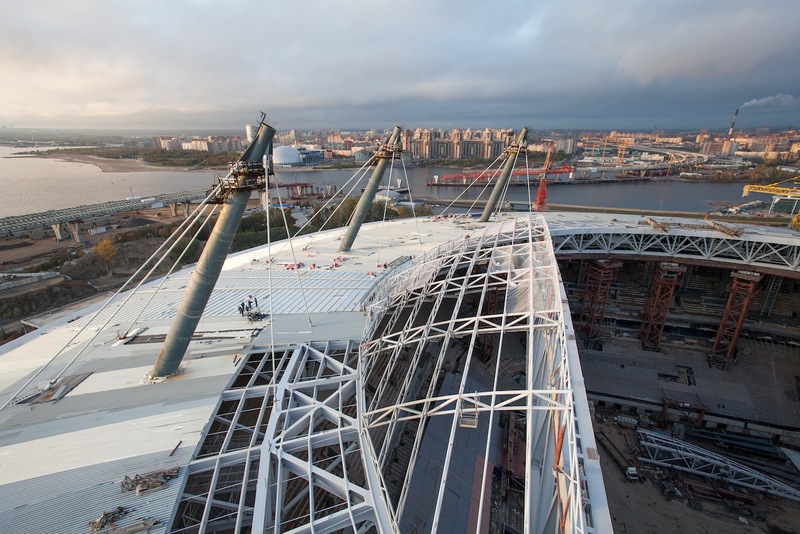 The roof of the arena on Krestovsky Island will be one of the largest in Russia in terms of its total area. In particular for this facility, a special technology of installation of large 67 m long aluminum sheets used as roof coating base material was developed. As of now, basic roof structures are already prepared in full. By the end of 2016 winter installation of the retractable segment is to be completed and in spring works for its coating with translucent film are going to start. The stadium’s facade finishing is to be completed in spring as well. The roof area of the arena on Krestovsky Island is approximately 71 000 sq. m which is comparable with three Red Squares. It is one of the largest roofs in the world: for comparison, Reichstag dome area in Berlin is approximately 3000 sq. m and the dome area of St. Peter’s Cathedral in Rome (one of the world’s largest) is approximately 22 000 sq. m.
“Soaring” over the stadium’s bowl the roof supported by 40 cable stays pulled on 8 pillars is one of the key conceptual design features. It will be the only one in Russia and one of the few in the world equipped with a retractable roof. Its presence will enable to operate the stadium on around the year basis both as a sports arena and as a concert and exhibition area. Temperature inside the arena, irrespective of the weather, won’t drop below +7°С. To assure such conditions, apart from the roof, the stadium with the immense 5 mln cub. m bowl will be equipped with the most powerful engineering infrastructure.